Good sized lot by railroad station. And made from old railroad ties! 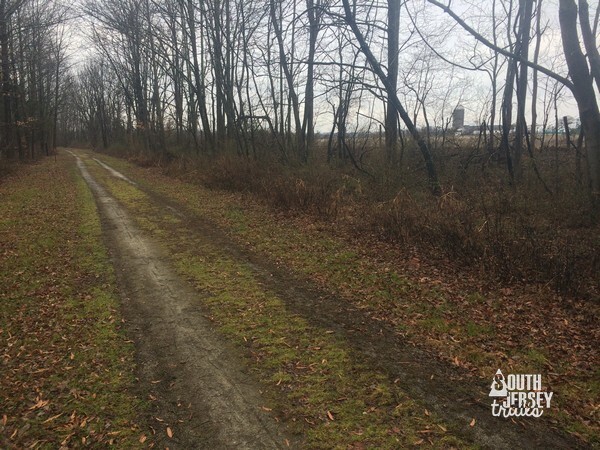 Markings – None, but you can’t loose a rail trail. My GPS track laid out over Google Earth. So yesterday, I was supposed to be in New England and the family was going down to Delaware to visit Nana and Pop. My plans ended up falling apart at the last minute, which left me alone at the house in the rain. Nope. Out I went, rain or no rain. My first stop was at Smithville, where I hiked the Ravine Trail (the last trail there I hadn’t done). My next stop was the Pemberton Rail Trail. I’d had this on my list for a good while, but decided I had to do it after hearing good things from one of the folks at Hike It Baby, who’d had a hike there the day before that we couldn’t make. 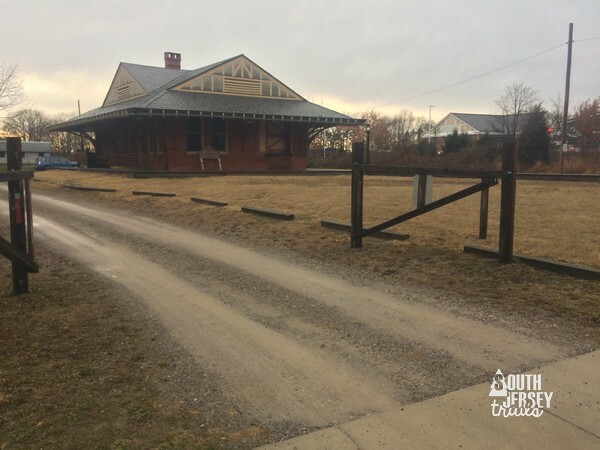 You start off at the old Pemberton Train Station. This used to be a museum, but sadly is not anymore. Nevertheless, the station is in great shape and a highlight of the trail, before you even take ten steps on it. This trail sets off down the old railroad right of way, passing between a housing development and farmland. 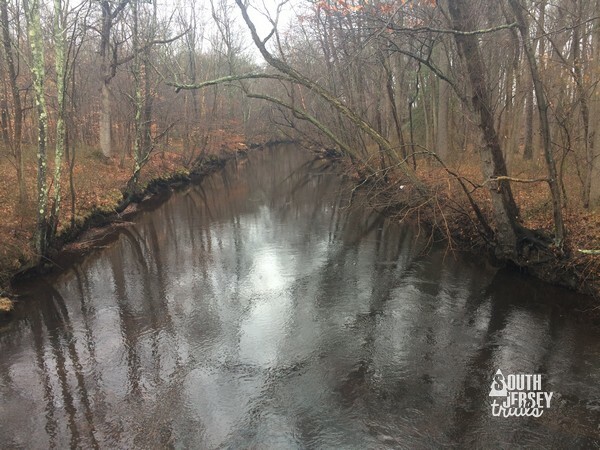 3/4 of a mile down the trail, you reach a large bridge across the North Branch of Rancocas Creek. It was even decorated up with candy canes to celebrate the season. See? 3/4 of a mile. From the bridge, it was another 1/4 mile to the first trail intersection. Wait, a trail intersection on a rail trail? Yes! This is the rarest of all trail layouts – a “Y” trail. We were walking on the north branch of the Y. If we made a hard left here, we’d end up on the south branch of the Y. For now, we’d continue straight onto the trunk of the Y. At this point, it was nothing but woods and wetlands on either side of the trail. It would stay that way until we hit the Pemberton MUA on the left side of the trail in a little less than a half mile. Still plenty of evidence of the railroad if you look around. Just what every trail needs, an MUA. Blech. From here, it was a walk past the MUA and a few houses until you reach Birmingham Drive. At this point, I had hiked 1.6 miles. From here, it was time to turn around. Now, you could make your life simple and go back exactly the way that you came for a perfectly lovely 3.2 mile hike. 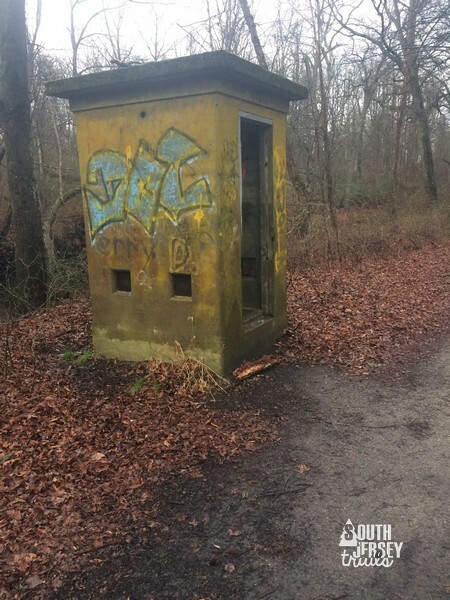 OR you could decide to see what was behind door… errr… branch number 2 – the south branch of the trail. In the spirit of “why not?”, I opted to take the south branch to the right when I got back here. 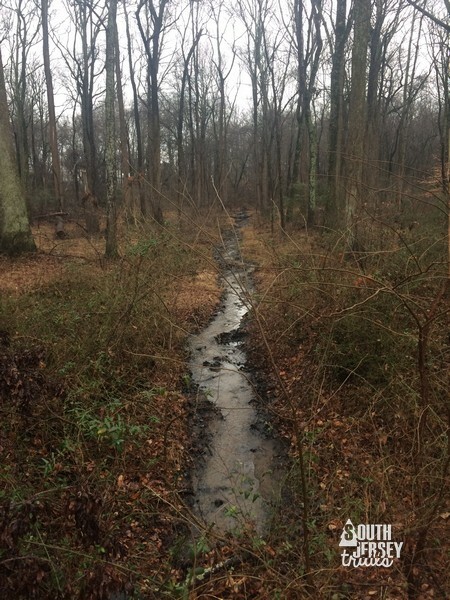 This part of the trail is very similar (although wetter) to the north branch and the trunk, up until it enters the Rancocas Conservancy’s Stavola Beachwoods Preserve. We made it to the Preserve! 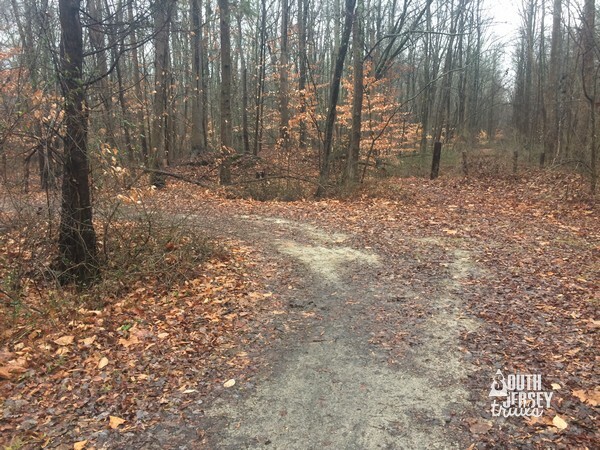 Once you enter the Beechwoods Preserve, you have the a nature trail that will loop off to the right. 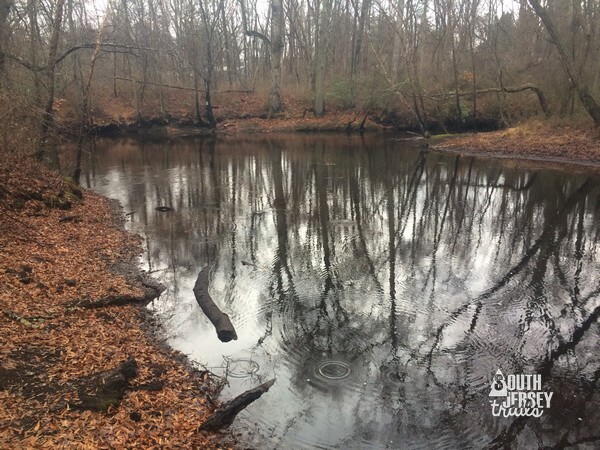 If you want to see where that goes, then you need to check out my post on the Stavola Beechwoods Preserve (not posted yet – my third hike for the day, after I go get my car and bring it back). But for now, we’re sticking to the rail trail. Well, actually, we only stick to the rail trail for another one or two tenths of a mile. At that point, the trail leaves the old railway right of way at a four way intersection. At the intersection, you have three option. Right is the Yellow Trail through the preserve. Don’t take that. Straight is the old railroad right of way, only full of dead fall because the trail is abandoning the railroad right of way. Don’t take that one either. Instead, head left to follow the very wide trail back to the trailhead at the Beechwoods Preserve. Railroad right of way… not good to continue on. Left trail = good idea. 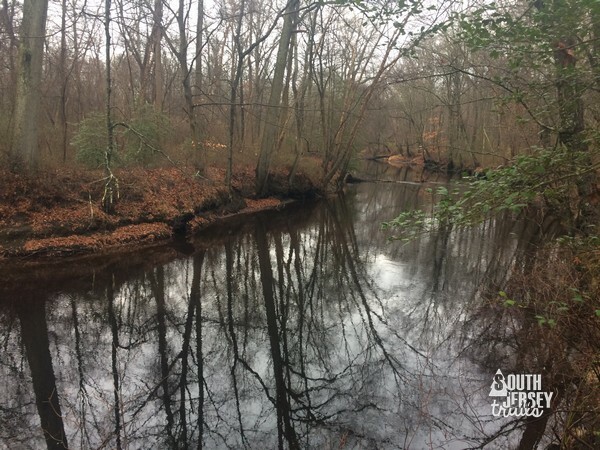 At this blog, we never get tired of Rancocas Creek. Not sure what this is, but its cool. End of the trail, complete with picnic table. At the end of the trail, there is nice little dam to check out. The problem with a Y trail is that now you’ve done the whole trail (3.2 miles so far), but you aren’t where your vehicle is. Whoops. You can either backtrack to the Y intersection and then walk up to your vehicle (roughly another 2 miles, for a total of 5.2 miles) or you can do what I did, which is walk up Hanover Street through Pemberton to where you left your car at the train station (another 0.6 miles, for a total of 3.8 miles). The walk through town is lovely, with nice old buildings to look at on the way, or a deli to get a sandwich or drink at. 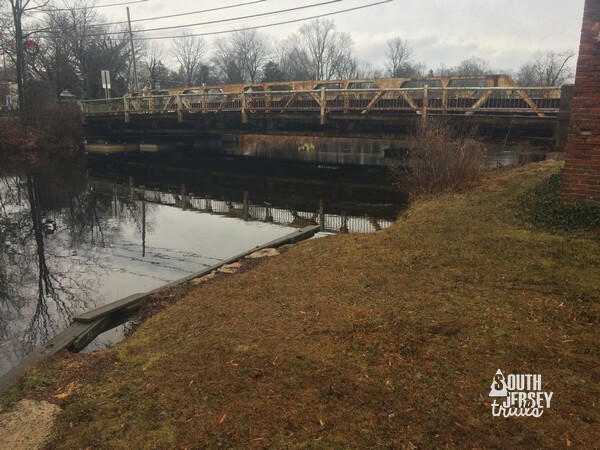 Plus, you get to cross Rancocas Creek on a cool, old bridge. When this blog promises cool, old bridges, we deliver cool, old bridges. 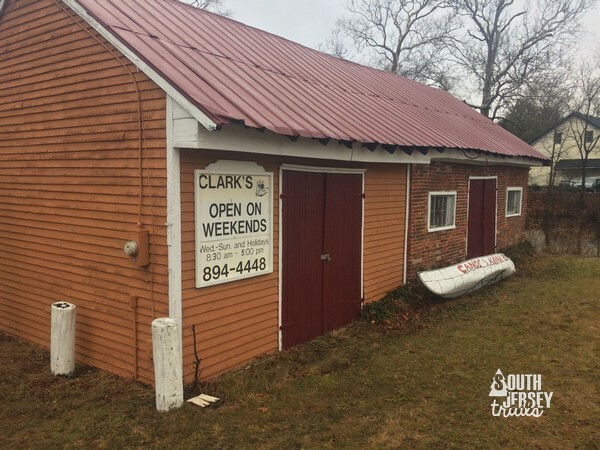 Clark’s Canoe Rental is located next to the road that takes you to the parking for Beachwoods Preserve. 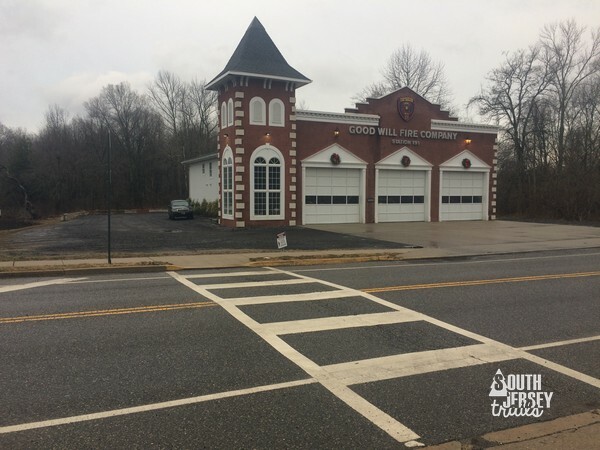 Firehouse is across the street, all lit up for the holidays. And finally back to the train station. 3.8 miles, a great hike (#2) for the day! 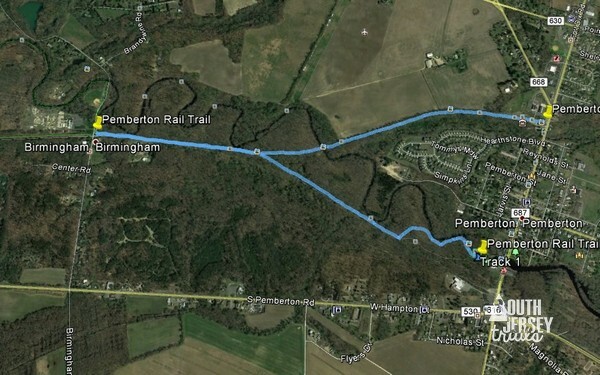 There are also plans to use this as part of the planned cross-county trail, which will be awesome if it ever comes about (first step is to connect this with the rail trail at Historic Smithville Park 1 1/2 miles away – I believe the plan is eventually link up with the proposed 13 mile long Kinkora Rail Trail that has a few miles completed so far). 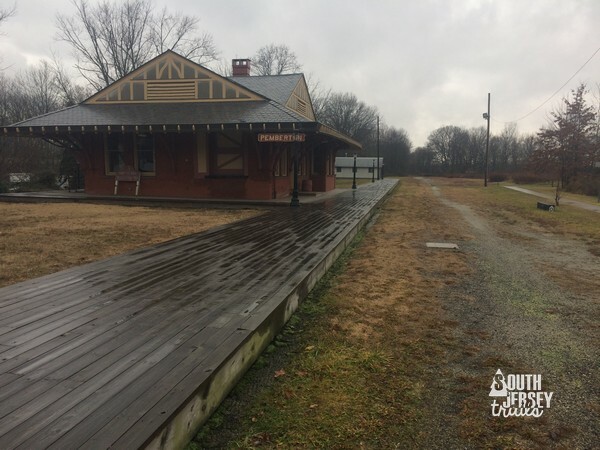 Nearby: Historic Smithville Park is nearby and very awesome. 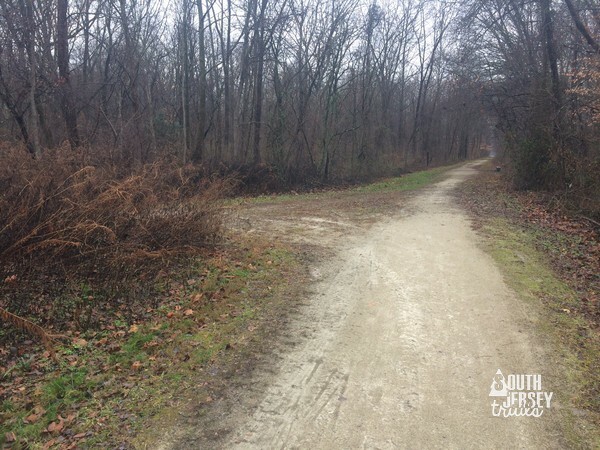 This trail also cuts through the Stavola Beechwoods Preserve and which has just over a mile and half of trails, part of which are made up by the Pemberton Rail Trail. 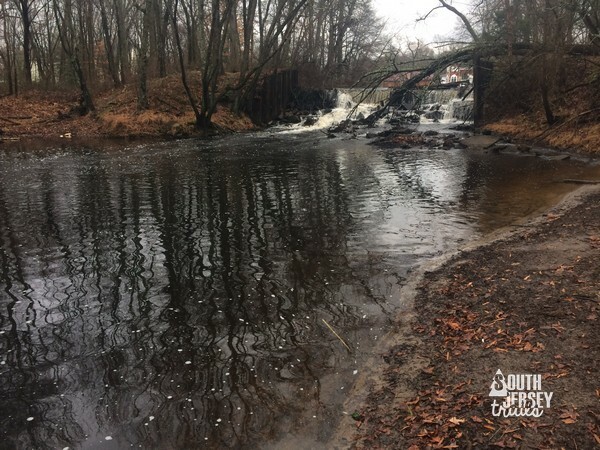 Rancocas Creek (North Branch), Pemberton Train Station, wetlands, and farm fields. Flat and straight isn't always exciting. 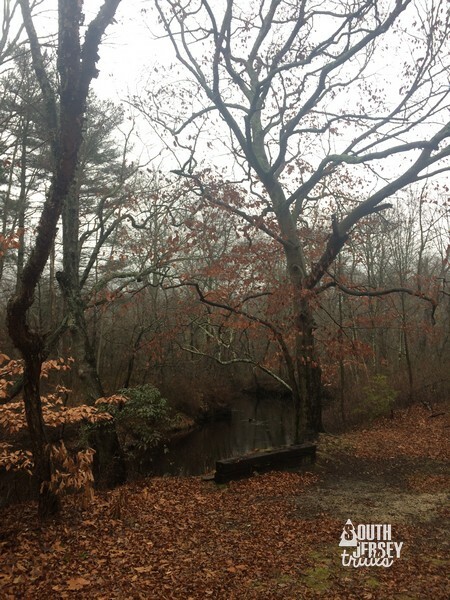 This is far from the most wildernessy trail in the pine barrens, but I love walking old rail trails and looking for remains of the railroads. So if you like railroads, a nice little almost 4 mile hike. 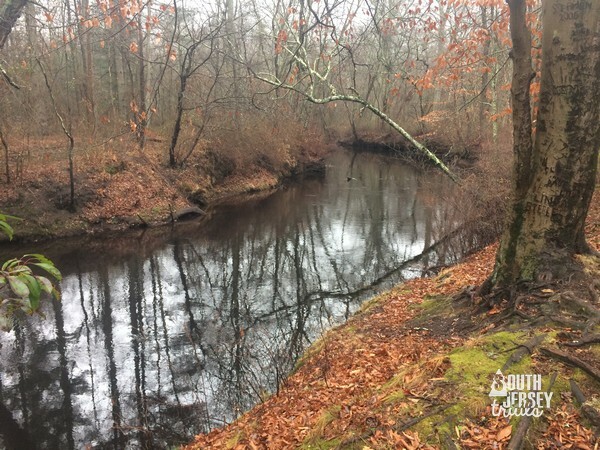 Finally, I agree that one can never get too much of the Rancocas Creek…have plenty of pix of it myself from various hikes at places that “feature” the creek! I cheated, we did Cattus Island back on December 8th. I took so many pictures (about 500) that it took me forever to sort through them. 🙂 Was still a good run through, three trails on Thursday, explored the Friendship Creek Preserve in Tabernacle on Friday, and just got back from the Battle of Trenton reenactment today. I’ll hopefully have the Beechwoods Preserve up today (half the trail is the Pemberton Rail Trail, so it seemed silly not to hike it while I was the Tuesday).